With typical Swedish understatement, furniture giant Ikea has decided to forego brandishing a fleet of conspicuous Prii and replace their corporate fleet (at least in the UK) with Civic Hybrids. They've also decided to hand out 60,000 energy-efficient bulbs to around 9,600 employees in an effort to make energy efficiency a priority. You know what else would be efficient? Not having to wind and wend one's way through room after room of time-suckage just to pick up a few Rotera lanterns. 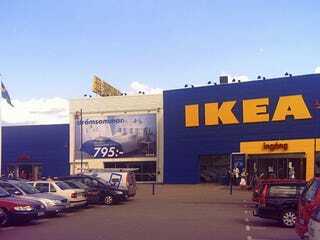 What's the fastest you've ever made it through an Ikea store — including purchase? Our personal best was 15 minutes at the Emeryville location.